BEND, Ore. — Deschutes Brewery will be featured in an upcoming episode of the new craft beer show “Brew Dogs”, aired on the new Esquire Network. The show’s format includes James Watt and Martin Dickie, owners of the UK’s fastest-growing brewery BrewDog, traveling across America visiting different American beer towns, celebrating distinctive craft beers and creating their own locally-inspired drafts. The two hosts spent some time at Deschutes Brewery a few months ago to film the upcoming episode which will air for the first time on Tuesday, October 29 at 10/9 central. For the episode at Deschutes Brewery, the show hosts worked with Kehs to create a beer that reflected Portland and the surrounding region. 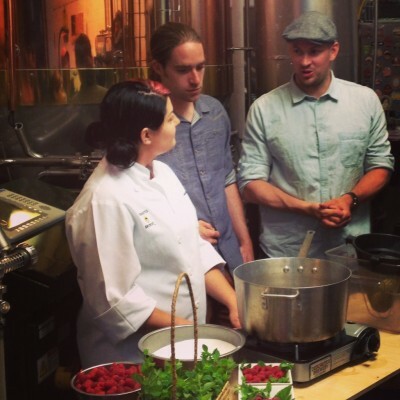 The resulting brew included foraged ingredients from the area such as yarrow and scotch broom, collected by local author Becky Lerner who wrote “Dandelion Hunter: Foraging the Urban Wilderness.” In addition, executive chef Jill Ramseier created some special syrups that could be added to the beer. The ultimate beer that ended up being served in the Portland pub after the filming of the show was dubbed Willamette Weiss and contained red cedar and scotch broom. Deschutes Brewery is hosting viewing events of the show at its pubs in Portland and Bend on October 29th at 10pm, complete with free popcorn and some other specially prepared “tv viewing” snacks.